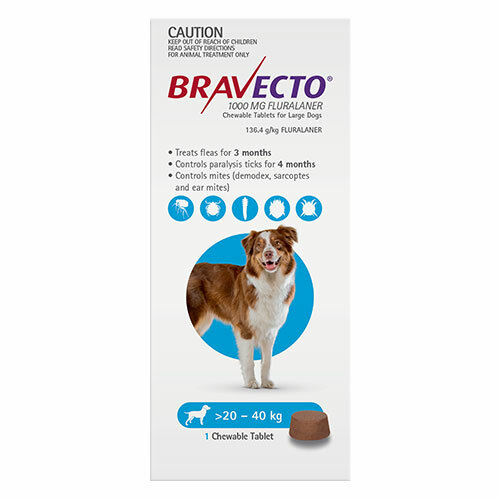 Bravecto (FLURALANER) Chewables for Dogs is the only oral chew to deliver 3 months flea and 4 months paralysis tick protection for dogs in a single dose. It eliminates fleas within 8 hours of administration and provides effective control of pre-existing paralysis tick infestations within 24 hours. 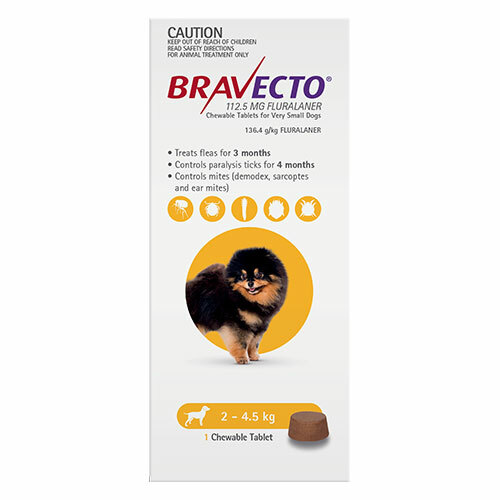 Bravecto can be used in puppies from 8 weeks of age weighing greater than 2kg. It is also safe for use in breeding, pregnant, and lactating dogs. Bravecto is available in single dose packs across 5 weight bands. 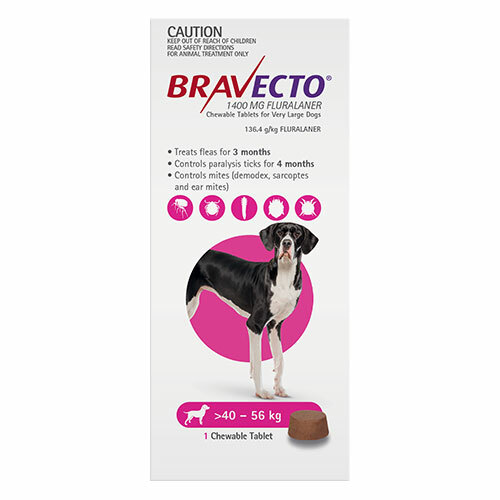 Bravecto chewable tablet is a highly palatable, easy to administer chew. One single dose provides 3 months of protection against fleas, 4 months protection against paralysis ticks and 8 weeks protection against brown dog ticks. The oral chew provides full-year protection in just four doses. The tasty chew is readily accepted by dogs. 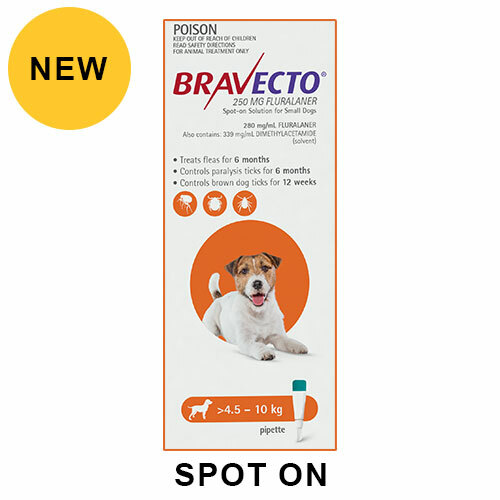 Bravecto Spot-On is an advanced flea and tick treatment for dogs. It treats flea and tick infestations effectively in dogs and controls future infestations. The topical solution starts killing fleas within 8 hours and provides the continuous protection against fleas and flea infestations for 6 months. It has systemic acaricide effect against ticks and provides persistent killing activity against paralysis ticks for 6 months. The topical treatment works against Brown Dog ticks for full 12 weeks. 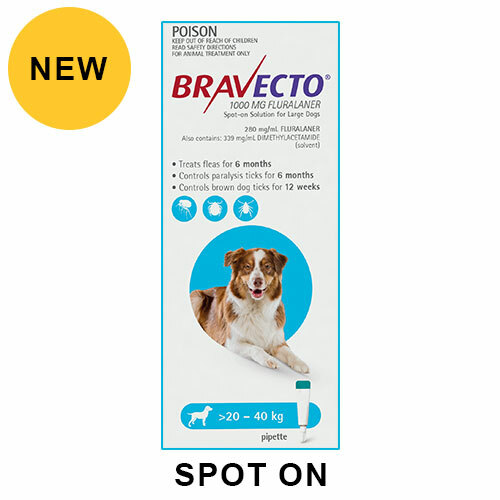 Bravecto spot-on can be used as a part of a treatment strategy for the control of flea allergy dermatitis. It is safe to use on puppies over 8 weeks of age and at least 2 kg. 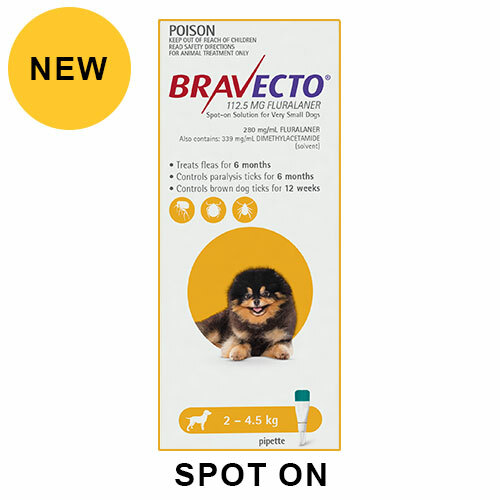 Bravecto topical treatment is suitable to use for breeding, pregnant and lactating dogs. Weigh the dog before starting the treatment. Mix with food or administer orally into the mouth. For dogs weighing more than 56kg use a combination of chews that most closely matches the bodyweight. The dog should be in a standing position. Part the fur between the shoulder blades of the dog to make the skin visible. Place the tip of the pipette vertically against the visible skin spot. Squeeze the pipette gently and apply the entire contents directly to the dog’s skin in one or several spots. Repeat treatment at an interval of 6 months. Simple to manage - Full year flea protection in just four doses means fewer treatments to remember each year, therefore less to forget! Protection at every season. Won't wash or rub off - Won't wash or rub off so your dog can go for a bath or swim. Bravecto is not for human use. Ensure not to drink, eat or smoke while administering the product. Immediately wash the hands with soap and water after treatment or wear gloves during treatment. Store it at room temperature of 59-86° F (15-30° C). 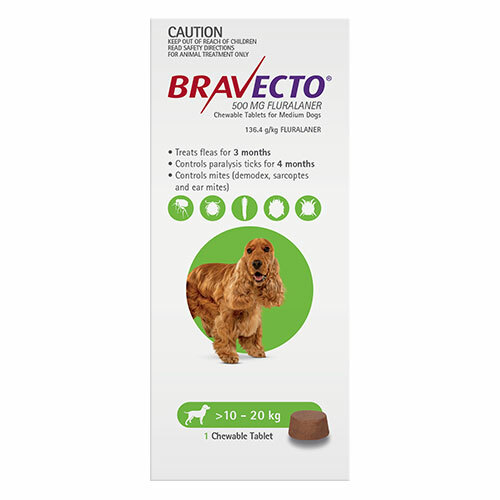 Bravecto can be used in puppies from 8 weeks of age weighing 2kg or more. 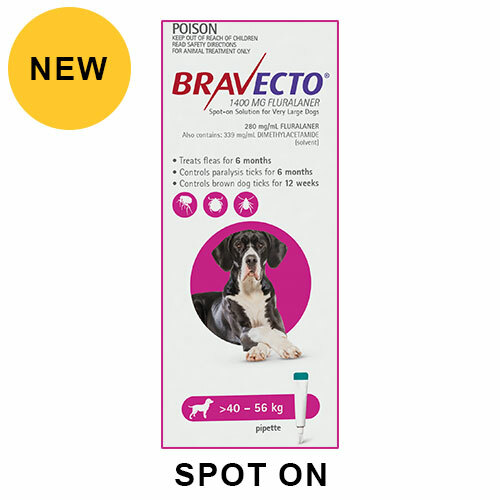 Bravecto is well tolerated in puppies when tested at up to 5X the clinical dose at 8 week intervals. 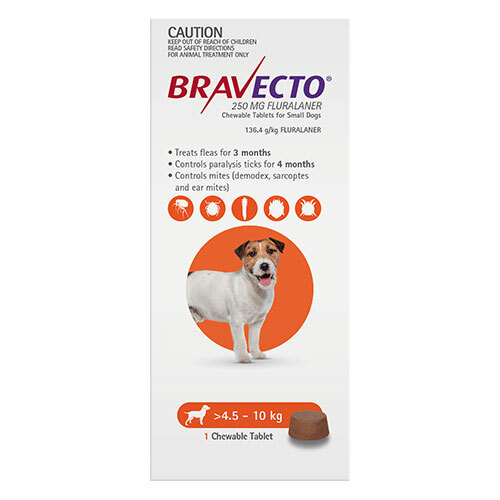 Bravecto is not clinically proven to be given to puppies less than 8 weeks of age. Consult a vet before treating dogs with the history of seizures, muscle tremor and ataxia. 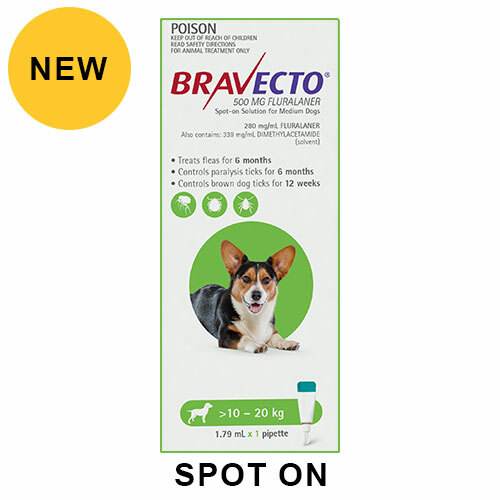 Some dogs may experience adverse reaction due to Bravecto. In case of a dog suffers from vomiting, diarrhoea, lethargy, decreased appetite, flatulence, or polydipsia, contact a vet immediately. Do not allow pets to groom after treatment. Avoid contact with eyes, hands and skin. Do not use on the skin lesions directly. Do not wash or allow your dog to swim within 3 days after treatment. Do not use on puppies less than 8 weeks of age. Safe to use in breeding, pregnant and lactating dogs. Tasty oral chew that your dog will love, making it easy and convenient to give. No mess to administer, won’t wash or rub off. Very good product highly recommended. I tried both the formulas and both of them works perfectly. Would surely recommend. Just gave to Mira and seems she loves it. No fuss and no mess. Really palatable. The best thing about this product that makes it stand out of all the other treatments is its 3 month efficacy. You don't have to constantly remind yourself about administering the product unlike monthly treatments. Have been using this product since 3 years and have recommended it to many of my friends. It is the best flea and tick treatment till date.